You would like to know which the Best Moisture Cream is? Then you’ve come to the right place. In this benchmark test we are looking at the different creams and we answer some of the main questions you have when it comes to application and effect of moisturizing skin care products on your face. First of all we come to the TOP 3 Moisturizers and then you’ll get to know the specifics and details of their application. The Doctor Eckstein Carotin Moisture Cream turned out to be our test winner. It contains next to natural vegetable oils other moisturizing active ingredients like lanolin and beeswax as well as the antioxidant Beta-Carotene (Provitamin A). Carotin offers anti-oxidative, wound-healing and anti-infectious qualities. On account of its liposolubility it is absorbed quickly by the skin. The Carotin Lotion, based on its abundance of its active ingredients, turned out to be a good night skin care. Overnight, the skin is being moisturized and refreshed. The cream causes a decline of by the negative moisture balance caused little wrinkles and soothes dried out facial skin if applied regularly. The Doctor Eckstein Carotin Cream is a good all-round care product for the care of dry skin as well as combination skin, while especially suitable for the use during the colder months of the year. In spite of its abundance of active ingredients, this cream leaves no undesirable fat film on the skin and can also be used if encountering acne. P.S. With oily skin, this abundant cream should probably not be your first choice. As a solution the manufacturer offers a carotin-based Facial Balm which offers a lighter and more liquid consistency and texture. Our Tip #1: Carotin Cream by Doctor Eckstein 3 Reviews $26.00 SHOP NOW! The Moisturizer by Elizabeth Arden bases its hydrating effect primarily on green tea extracts, honey and shea butter. It is suited well for dry skin as well as for combination skin. Elizabeth Arden Green Tea offers a fresh vivid smell while not being too strong in odor. The cream contains a highly refined mineral oil which has been the subject of an ongoing debate within the skin care industry. We regard this ingredient as uncritical and safe to use because it helps the skin to bind moisture efficiently, while causing no skin irritations. The Moisture Cream by Elizabeth Arden can be well applied and distributed onto the skin. It calms and soothes the skin immediately when applied and keeps the skin from losing moisture all day long. The tube contains 500ml, which means that the Elizabeth Arden Moisturizing Cream makes for the most economical care product within our selection of these TOP 3 Creams. This is why we awarded this cream to be our price-performance winner. Our Tip #2: Elizabeth Arden Green Tea Cream 10 Reviews $19.50 SHOP NOW! The Lavera Moisturizing Cream contains next to rose petal extract additional extracts such as jojoba oil, aloe vera and soy. This cream has the lightest and wateriest low fat portion texture out of all three creams we tested. Therefore, this cream is suited perfectly for oily skin. Especially in the case of skin impurities, the Lavera Q10 cream plays its strengths well. It hydrates the skin without blocking the pores and thereby preventing the creating of a fertile soil for further impurities. The Coenzyme Q10 supports many energy-supplying processes in our skin cells and therefore makes for much more than just a regular anti-aging caring substance. You may find further info on the Q10 effect here. The only negative aspect with this cream is its relatively high alcoholic content. Because alcohol can lead when having to deal with very sensitive skin to irritations, this cream is not as skin-acceptable and soothing as the other two moisturizers. The Lavera Q10 Cream is available on the Internet starting at $23.75 . Our Tip #3: Lavera Q10 Cream 2 Reviews Currently not available SHOP NOW! What is the idea behind Moisture Creams? Moisturizing creams have many names – often they are called facial care creams or day/night creams, or in some cases referred to as an anti-aging creams. It remains a fact, that moisture creams make up the majority of regularly used facial creams. Often it makes for the only skin care product which is used regularly. Normally, such a cream is applied daily on the skin to refresh the skin and to moisten as well as to prevent skin “tension” and wrinkles. Actually, every facial care cream brings moisture-providing qualities with it – sometimes more and sometimes less. Even though all facial creams are moisturizing, every cream has its own focus. This is either directly mentioned on the packaging, or it is already visible by looking at the name of the cream. You may find for example, moisturizing creams with hyaluronic acid, oil essences and plant essences or special anti-aging ingredient complexes. Further, every moisturizing cream has its own purpose – mostly it is a skin soothing function, sometimes regeneration or skin tightening. The above all to be obeyed principle is to find the cream optimally working with your skin type and complexion. And this is anything but easy – there are probably several hundred moisturizing creams available on the market. How does a Moisturizing Cream work? Our skin is made to a large part out of water (like our whole body). As long as the moisture balance functions the way it is supposed to, the skin will look healthy and have a smooth feeling. In this case, you may not need a moisturizing cream. Water evaporates from our skin – this is absolutely normal and it is part of an important temperature regulation function of our body. If the skin loses exactly the same amount of water as it absorbs from the inside of the body, everything is fine and you won’t necessarily need extra skin care. You will only need a moisturizing cream as soon as your skin loses more water than it can absorb from your body. If that is the case, the skin is easily dehydrated and grows old quicker than that would be the case for a well moisturized skin. Such problems appear as soon as the natural skin barrier is disturbed. This can be caused by many different reasons; we will later look at them closer. The moisturizing cream repairs the damaged skin barrier – at least for some hours. This may not be a lasting solution, but it can absolutely be a short term remedy. By water-binding and aliphatic (fat-containing) substances the cream prevents further humidity losses. The skin is thereby protected naturally and can regenerate again – at least as long as the effectiveness of the moisturizer lasts. When should you start with the use of a Moisture Cream? Undesirable moisture loss seems to have happened more often in the case of older/more mature skin. Because it is mostly based on structural water deficits, what is needed above all, are rich creams and facial oils. Nevertheless, you should also care for your skin in younger years in order to make provision for the future and to keep the skin young for many more years to come. Therefore, one should arguable care already from the middle of the 20s about the issue of anti-aging. A good moisturizing cream is the most important part of a preventive anti-aging care, since dry skin can appear at every age. Next to a lack of sleep and consumption of alcohol, stress and hormonal variations can also be the reason for an injured skin barrier. Also excessive solar radiation and frequent bathing are further risk factors. In winter, temperature variations are the reason for the fact that the skin needs more moisture. Therefore, you should use a rich cream during the colder season, while in the summer a light moisture cream can be sufficient. You can do something against a poor skin moisture balance from an early stage in life. This is why a good moisture cream should become a firm corner stone of your everyday skin care – at any stage of your life. What makes for a good Moisture Cream? Basically a good moisturizing cream consists of a base substance (often water) as well as lipids and occlusive ingredients. Lipids fill in microscopic small skin unevenness which often originates from environmental factors and moisture losses. Thus the skin will become more even and look and feel fuller than ever before, which will further decrease future moisture losses. Occlusive components of the caring substances settle like a moisturizing layer on the skin and help binding water more efficiently. These are the ingredients which make up the tangible (and sometimes also visible) protective layer of the skin. Depending on for which skin type the cream was designed, it contains a different composition of the three above mentioned substances. Hereby, the rule of thumb is: The oilier the skin, the lesser amount of lipids and occlusive ingredients the moisturizing cream should include. What a good moisturizing cream should not contain or only in a low dose, are ingredients with irritating potentials. These are above all preservatives and odoriferous substances, but also an excessive application of nano particles and alcohols. Now, we will discuss different skin types and state which kind of moisturizing care is important. We have already talked about how dry skin is created and what can be done against it and its causes. When faced with dry skin, you should always apply a very greasy, occlusive caring cream. This is important because the lack of the skin’s lipids is repaired, so that the natural skin barrier can be built up efficiently against additional moisture losses. If the chosen cream should not bring the desired effect, one can additionally apply a moisturizing serum which can be applied directly under the cream. This is how the moisturizing effect can be further increased. Oily skin has enough lipids, but still loses water on account of its insufficient skin barrier. Here, above all water-binding ingredients are needed which can adjust the moisture balance without increasing the quite superfluous lipids. A conceivable solution would be a fat-free matting cream which refines the skin structure and regulates the sebum production. Also with combination skin, you should take into account with oily skin parts, no to use too much cream. A moisturizing care which restores the natural skin balance is to be recommended here instead. However, the fat portion of the cream should not be too high and the consistency of the cream should be a little lighter. In this case you could also think about a neutral moisture providing gel, because it mostly is made of a lighter formula. When faced with acne, you should reach to a non-comedogenic moisturizing cream. This cream will not block the skin pores and thereby creates no basis for further skin impurities. Instead, anti-infectious ingredients like aloe vera or chamomile essences are to be recommended. Is there a special Moisturizing Cream for the eyes? The skin around the eyes often has a special need for high moisture. Sometimes the skin still feels tight around this area, although you may have applied enough cream. This is why there are special humidity creams for the eyes, as for example this skin care cream. Regarding the Eye Skin Care, we recently published a dedicated post: Best Eye Serum Review. Are there special Moisturizing Creams for men? Male skin is a little bit differently structured, because one of its characteristics is a higher production of sebum. Therefore, a man’s skin needs lighter, more liquid creams (or a gel). Just for your information, I already published an article about this topic. Dr Eckstein Carotin Moisture Cream 1.66 ounce 3 Reviews $26.00 SHOP NOW! Elizabeth Arden Green Tea Honey Drops Body Cream, 8.4 oz. 10 Reviews $19.50 SHOP NOW! 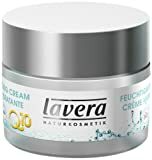 Lavera Anti-Ageing Moisturising Cream Q10 Vegan 1.7oz 2 Reviews Currently not available SHOP NOW!